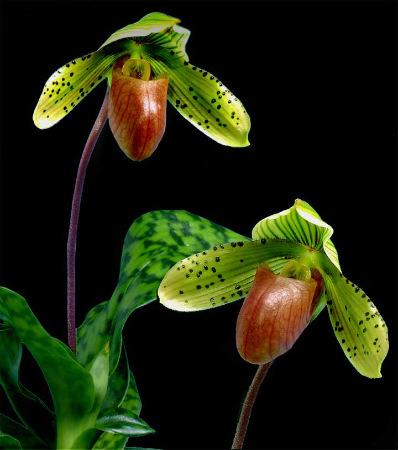 The common name of Paphiopedilum is Lady Slipper Orchid, refering to their unusual cup-like pouch in the flower. These fascinating plants display flowers that have an incredible variety colors and last for 6 weeks or more. Paphiopedilum is a good starter plant if your growing area is small and lacks sun. If you can grow African Violets you can grow this orchid - the care is the same. Their compact size also makes them an excellent windowsill plant. In Nature, Paphiopedilums grow along the forest floor (instead of in the trees) where their roots get constant moisture. Perfect for Hydroponics! They do not have the water storing capabilities of most orchids so they don't require long dry periods between watering. For beginners, Paphiopedilums are a great "next plant" after Phaleanopsis. Our Hydroponic system makes watering easy. Paphiopedilums do not have the water storing capabilities of most orchids so they don't require a "dry period" between waterings. It's okay to water when gauge reads empty. Paphs enjoy bright light but avoid direct sun. Their leaves burn quickly with too much sun. Try protecting plant from direct sunlight by positioning it behind another plant that needs the sun (Dendrobium, Cattleya, Oncidium, etc.) Shear curtains will also temper hot sun. Paphiopedilums are divided into two groups; the warm growing mottled leaf types, and the cooler growing green leaf types. Mottled leaf Paphs appreciate temperatures no lower than 60 degrees at night (goes welll with Phaleanopsis). Ideally, the green leaf Paphs like temperatures in the 50's at night. Both groups will tolerate temps in the 90's during the day with good air movement. We've found that in most cases you can grow both types of Paphs side by side in the same temperature range. Be aware that winter temperatures can reach freezing near a window (too cold!). Paph's bloom only once per growth. You'll need to wait until a new growth matures for the next set of flowers. Several varities are sequential bloomers. After one flower fades and falls from the plant, another bud will appear, ready to open. Look for "Cochlopetalum" in the name. With the right condtions, these plants will produce flowers for several months.